Type and Use: Annual with edible foliage. Growth Habits: Aggressive annual that spreads readily from seed. It has purple flowers and either burgundy, purple, or green leaves. Perilla is often confused with opal or black coleus. Culture: Very easy to grow in most any soil. Be careful where you plant it - it might be in your downhill neighbor’s yards next year. 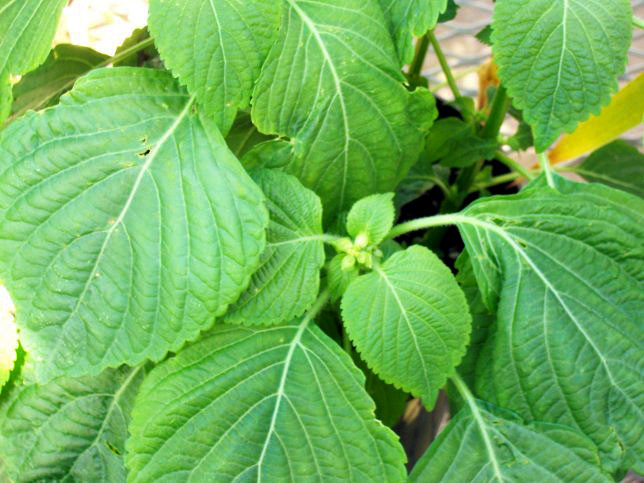 Troubles and Solutions: Perilla reseeds so easily that it can become a pest. Harvest and Storage: Harvest and eat fresh or store in the refrigerator. Leaves can be frozen for use in the winter. Notes: Also called Beefsteak Plant. The leaves are used to flavor meat and vinegars. Many Japanese dishes serve a perilla leaf. Varieties: Green leaf - Green Shiso, Green Cumin. Purple or red - Red Shiso.